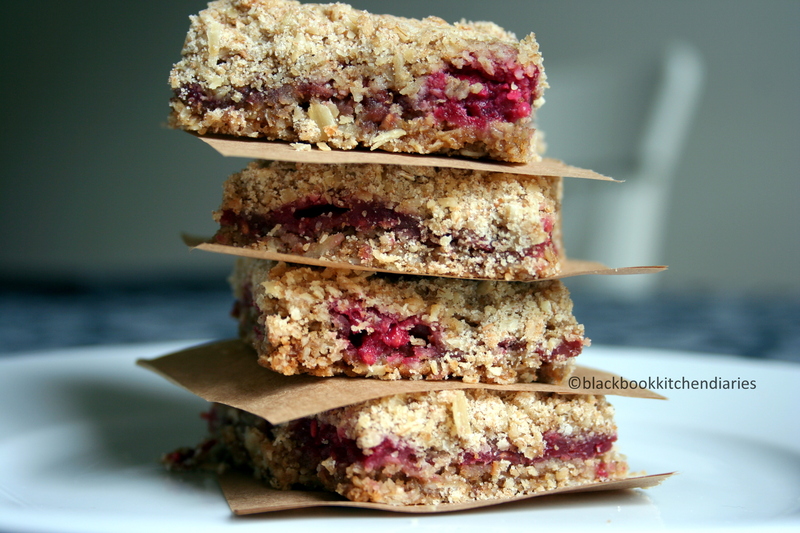 What I love about these bars is that it’s made from fresh raspberries and it is so easily put together. If you’re like me, and have been making these in the past with raspberry preserve than you might want to try this version. It takes a little more than twisting a jar but the end results is nevertheless very rewarding. The lemon juice and the zest really bring out the sweetness of the fresh berries. You can even try this recipe with different kind of berries or even mix it up. I like having this with my morning cup of coffee and it even taste wicked warm out of the oven with a generous scoop of vanilla ice cream. Preheat oven to 350 degrees F (175 degrees C). Grease one 8 inch square pan, and line with greased foil. Combine whole wheat flour, sugar, baking soda, baking powder, cinnamon, nutmeg, salt, and rolled oats. Rub in the cold butter using your hands or a pastry blender to form a crumbly mixture. Press 2 cups of the mixture into the bottom of the prepared pan. Spread the raspberry filling to within 1/4 inch of the edge. Sprinkle the remaining crumb mixture over the top, and lightly press it into the filling. Bake for 35 to 40 minutes in preheated oven, or until lightly browned. Allow to cool before cutting into bars. Make the raspberry filling: In a medium bowl, mix together sugar, honey, lemon zest, vanilla, corn starch and lemon juice. Then, toss in the raspberries gently using your hands until the raspberries are evenly coated.